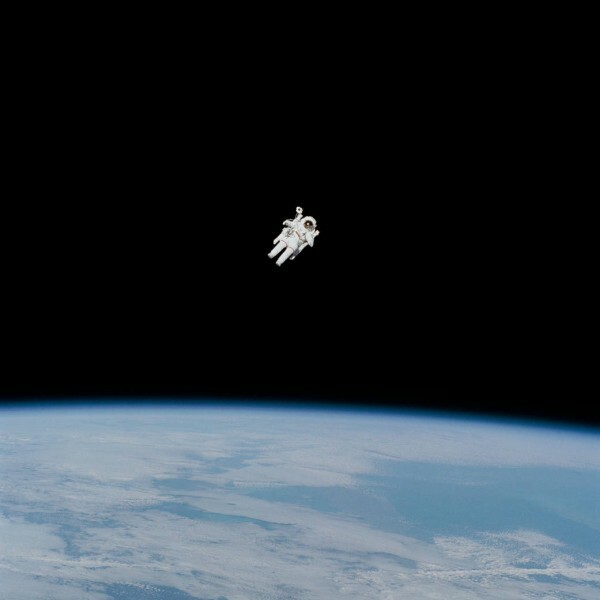 In this Feb. 7, 1984 photograph taken by his fellow crewmembers aboard the Earth-orbiting Space Shuttle Challenger on the STS-41B mission, NASA astronaut Bruce McCandless II approaches his maximum distance from the vehicle. McCandless became the first astronaut to maneuver about in space untethered, during this first “field” tryout of a nitrogen-propelled, hand-controlled backpack device called the Manned Maneuvering Unit (MMU). Since this historic first, NASA astronauts have performed spacewalks, or extravehicular activity (EVA) in NASA-speak, on the Gemini, Apollo, Skylab, Space Shuttle and International Space Station programs. Astronauts have explored the lunar surface, completed 82 spacewalks outside of the space shuttle, and 187 spacewalks, to date, outside the International Space Station. A total of 166 hours of spacewalks were carried out to service the Hubble Space Telescope. Today, NASA is developing new advanced spacesuits for use by astronauts as they travel to new deep-space locations on the journey to Mars. The next-generation suit will incorporate a number of technology advances to shorten preparation time, improve safety and boost astronaut capabilities during spacewalks and surface activities.